Irish American or American Irish? Do you ever just wonder about stuff that may not really be that significant? Oh, so it’s just me then, ah well. There is an advert on TV here for Heineken and it’s a football/soccer advert where football is a person who has come to America and struggled to blend in but has now become an American, and is called soccer. Anyway, this advert got me wondering about all the Irish Americans there are. Over 33 million Americans claim Irish ancestry but here is my little conundrum. 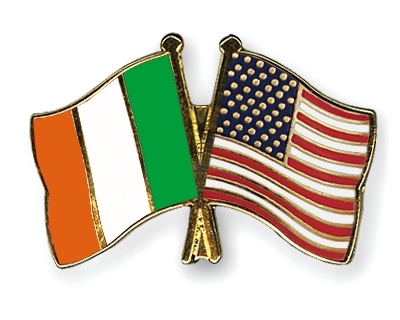 Are these not American Irish, rather than Irish American? You may ask why as if their ancestry goes back to Ireland, then they are Irish first, American second. Well my feeling on it is no they are not, they are American first, Irish or wherever their ancestors came from second, thus the name should be American Irish. In a few years when I hopefully become a fully fledged US citizen then I can claim to be Irish American, Irish as my country of birth, America as my now country of citizenship. Back home in Ireland you never here from anyone in Ireland saying they are French Irish, or Danish Irish and it is definitely an ‘American’ thing. Don’t get me wrong, there is absolutely nothing wrong with it and it was just one of those things that floats into my head, gets wondered about for a while and then gets put away. So regardless if you are Irish American, American or Irish, German, Dutch or English, be proud of where you were born, where you live, the flag and anthem of your country and be proud of your heritage and ancestry. Maybe the term American Irish will take off for those born in America but with Irish heritage, and Irish American will be the tern used to describe people like me, those that are Irish born and raised but now live in America. Your point is very well-taken, Billy. One should list their country of residence first and their cultural identity second. Perhaps the reason so many Americans specify the primary culture with which they identify is because we are a nation of immigrants. So many cultures in America… it might be the way we remember from whence we came.